I recently donated a workshop in an auction of promises at a local charity picnic ball, which was won by some fabulous ladies wanting to learn how to create garden hand tied posies. Armed with buckets filled with flower and spilling with foliage I made my way to the gorgeous Middle Stanley Farm which can be hired as a picturesque wedding venue. 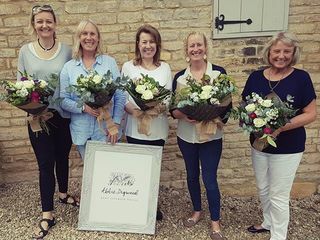 With a hot coffee in hand, ladies armed with flowers, scissors and hessian we created an array of delicate garden posies. Each with their own personalities shinning through. Everyone had a lovely time chatting over fond memories the flowers stirred in them and have a giggle over the “spiraling” of the stems. We all went home with a gorgeous design each, some for their kitchens and some giving as gifts to dear friends. But each all richer with the knowledge of how to get the best from the flowers. If you are interested in hosting a workshop please contact me via the contact page and I can send on all the workshops I have to offer.